Bee, thanks for posting that. On my way to work this AM, I heard NPR news mention something about McCandless, but did not hear the piece from "All Things Considered". So I read the article linked above with great interest. What a detective story! Then I looked up the NPR site, and they have an interview with Jon Krakauer, who literally "wrote the book on McCandless". It pretty much summarizes the New Yorker article, but is good to listen: Did Jon Krakauer Finally Solve 'Into The Wild' Mystery? To summarize: McCandless was subsisting on small game, roots, berries and seeds. He collected and ate the seeds of a "wild potato" plant, Hedysarum alpinum, which is described as nontoxic in books and scientific literature. But they are wrong, in some situations -- one being McCandless' age and condition: young male living on a subsistence diet. Jon Krakaur found a paper published by Ron Hamilton, who had knowledge of a WWII prison camp, Vapniarca, where lack of food led to giving the prisoners horse feed ("pea fodder"), which led to many prisoners' slow paralysis, a disease called Lathyrus. Hamilton's paper, The Silent Fire: ODAP and the Death of Christopher McCandless describes sampling and experimenting with the Alaskan wild potato seeds, and finding they contain higher concentrations of ODAP, the toxic protein that causes lathyrus, than the other plants known to be toxic. While the disease is known to permanently paralyze thousands in the poorest third-world areas, until Hamilton's discovery, the wild potato was considered safe and edible. The only curious question that comes to mind: Why didn't Hamilton contact Krakauer when he made the discovery or posted his paper? It seems that months passed before Krakauer discovered the paper on his own. It is all quite an interesting chemistry detective story. I have both a Chemistry & Hortoculture background, so the topic of edible/toxic plants intrigues me. A couple of weeks ago, I spent hours studying the difference between Water Hemlock, wild Parsely & wild carrots. At a glance, they all look alike, but the slightest contact with Water Hemlock is fatal. Anyhow, the list of toxic plants & their side effects can leave one to choose death by starvation, rather than suffer the alternate consequences of the poisons. Water hemlock? By "contact" do you mean ingesting it? 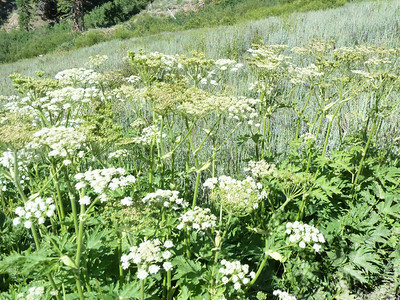 It sure looks like all the plants in this Google image search for water hemlock. ....and so begins the struggle: Is THIS it?? * At closer look, was there maroon highlighting on the green? THIS IS A PLANT THAT YOU DO NOT WANT TO MAKE A CASUAL MISTAKE WITH, so avoid anything with a white umbel (whoorl-like flower structure) and parsely-like leaves in the wild. Toxicity? Just getting the sap on your hands and accidentally transferring a miniscule amount can be deadly. There is strict protocol when handling this deadly beast. Thanks for the little education there. Here I thought the worst plant I'd find in California is Poison Oak or Ivy. Scary indeed. Generated in 0.207 seconds in which 0.198 seconds were spent on a total of 14 queries. Zlib compression disabled.